This is going to sound cheesy but it sometimes surprises people that Cheddar is actually a place and not just a cheese! 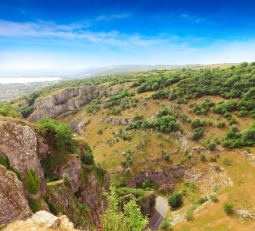 The area is famous for both its cheese and the stunning Cheddar Gorge. The gorge itself has many tourist attractions including 2 sets of caves, Jacobs’s ladder and many novel shops offering everything from Teddy bears to old fashioned sweets. The area attracts thousands of visitors every year. As a place to live Cheddar offers all the benefits one would expect, plenty of shops, good schools and amazing scenery. With good links to Bristol, Wells, Weston-super-Mare and Taunton the village is well positioned, the rest of the world is easily accessible with Bristol airport being just 10 miles away. Click here to search our database of properties for sale and rent in Cheddar.